Avjobs.com has been widely acknowledged as The "Gold Standard" Aviation Employment Services leader since 1988. 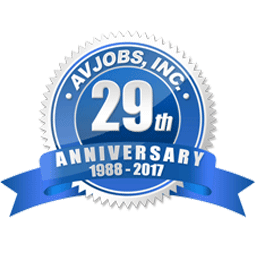 LITTLETON, CO – January 1, 2017 – Colorado based Avjobs.com marks twenty nine year commitment to the aviation community. “This milestone says a great deal about our dedication to the industry and our success”, says Pat Smith, Director of Marketing at Avjobs.com. Today, tens of thousands of aviation employers find Avjobs.com is a crucial part of their recruitment strategy. In addition, we assist industry job seekers from high school students to seasoned professionals. This combination successfully brings employers and employees together in one central location. Our valuable resources include Job Search, Resume Service, Aviation Directory, HR Solutions, Career Overviews, Aviation Schools: The Original Aviation School Database, and more.